A classic fettuccine Alfredo recipe is transformed with zucchini “noodles” replacing the traditional pasta. This Alfredo recipe features a simple cream cheese-Parmesan sauce that adds the perfect finishing touch. Use vegetable peeler to cut zucchini into thin lengthwise slices; place in colander. Sprinkle with salt; let stand 15 min. Rinse zucchini; gently squeeze between paper towels to remove any excess liquid. Heat half the oil in large skillet on medium heat. Add half the zucchini; cook and stir 4 to 6 min. or until crisp-tender. Place in medium bowl; cover to keep warm. Repeat with remaining oil and zucchini. Mix flour and broth until blended. Add to same skillet with cream cheese product and 2 Tbsp. Parmesan; cook 3 to 5 min. or until sauce comes to boil and thickens, stirring constantly. Add zucchini; stir to evenly coat with sauce. Cook and stir 1 to 2 min. or until heated through. 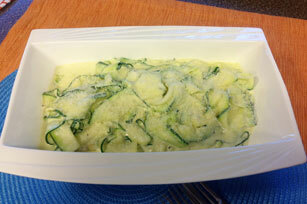 For added colour, prepare using a combination of green zucchini and yellow summer squash. To save time, use a julienne peeler or mandolin to make the zucchini "noodles." Sprinkling the zucchini strips with the salt, then letting them stand helps to extract the excess water from the zucchini.